The day had arrived for us to bring our stuff together. My wife and I had done things a little out of order (especially for someone in a ministry position) and bought a house before we got married. We found a great deal on a house in a neighborhood well suited for our jobs in different towns, so we jumped on it. The plan was for Lydia to move into the house for a few months and I would move in with one of my elders. While I was thrilled about buying my first house, I experienced an incredible rush of resistance as the moving day wore on. As many of you know, when a woman and man merge their belongings together – 9 times out of 10 the woman’s stuff will win out while the guys stuff finds the nearest trash heap or Goodwill. In this case it was no different. If I remember correctly, my living room furniture and TV made the cut while many other things were shown the door. I expected as much, but as the hours passed I started to feel uncomfortable. Many of my possessions (as worn and threadbare as they were) no longer held a lot of importance. Discomfort led to anxiety, then to resentment. Before I knew it I was really upset with my then fiancé. I had no idea why so much of my stuff didn’t make the cut. Then came the reckoning. 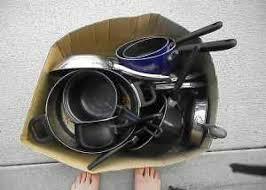 As we were unpacking boxes for the kitchen, a ragged box of my old pots and pans came up for judgement. They were swiftly deemed to be junk and put in the appropriate pile. Side note: My wife was right. They deserved the junk pile. Just read on. I then became visibly agitated and upset. What my wife didn’t know was some of those pots and pans were once my grandmothers and I had a really good reason to keep them in our kitchen. Though I had used these sacred pots to cook ramen noodles once every two weeks up to this point made no matter. They were special and we were keeping them! Of course she was caught off guard and confused. Being the good woman she is, she agreed we should keep them (albeit in a deep cabinet where they would never see the light of day) because they mean so much to me. But, did they? As far as I can tell I never had a sentimental attachment to these pans before. I had no plans to put them on display or hand them down to my firstborn. During times of transition and change, we tend to hold onto things that have some connection to our past. We want to associate things to a past identity that really have no value. Those pots and pans needed to go, just like my old self when I transitioned into my marriage. As I have written about over the last few weeks, I have been struggling a bit with my own identity coming out of youth ministry into non-profit work. Being the summer, my time has been spent doing other things than traveling and hanging out with teens all of time. And, it has been a real struggle to adjust. But maybe I am still hanging on to the pots and pans of my past. While they might have had value at one point, in this part of my life they need to go. There are better and different things ahead and all those things can do is weigh me down. As we talk of refocus this week, I find myself dwelling upon what is distracting me. My identity for so many years had been founded in a job, a career. This transition affords me the opportunity to grow up and find my identity in something more real – Christ. Today I want to challenge you to read through the Colossians 1:15-28 passage from the liturgy a few times. Let it sink in. This is where your true identity lies. Everything else might just be old pots and pans. This entry was posted in Uncategorized and tagged christ, Colossians, Identity, pots and pans. Bookmark the permalink. Reallly a nifty post Chris. Thanks for the thoughts and truths. Thanks, Beverly! Really the post show how much of a doofus I can be, but I’m glad to have you read it!